Climate refers to long-term, predictable atmospheric conditions, while weather refers to atmospheric conditions during a short period of time. Climate refers to the long-term, predictable atmospheric conditions of a specific area; it does not address the amount of rain that fell on one particular day or the colder-than-average temperatures on a given day in a biome. Weather refers to the conditions of the atmosphere during a short period of time; weather forecasts are usually made for 48-hour cycles. Specific, one-off weather occurrences are not necessarily indicators of climate change. weather: the short term state of the atmosphere at a specific time and place, including the temperature, humidity, cloud cover, precipitation, wind, etc. Climate refers to the long-term, predictable atmospheric conditions of a specific area. The climate of a biome is characterized by having consistent temperature and annual rainfall ranges. Climate does not address the amount of rain that fell on one particular day in a biome or the colder-than-average temperatures that occurred on one day. In contrast, weather refers to the conditions of the atmosphere during a short period of time. Weather forecasts are usually made for 48-hour cycles; while long-range weather forecasts are available, they can be unreliable. Climate: Climate refers to long-term, predictable atmospheric conditions of a specific area. Weather, in contrast, refers to the conditions of the atmosphere during a short period of time. This map illustrates the various climate conditions around the world. To better understand the difference between climate and weather, imagine that you are planning an outdoor event in northern Wisconsin. You would be thinking about climate when you plan the event in the summer rather than the winter because you have long-term knowledge that any given Saturday in the months of May to August would be a better choice for an outdoor event in Wisconsin than any given Saturday in January. However, you cannot determine the specific day that the event should be held because it is difficult to accurately predict the weather on a specific day. Climate can be considered “average” weather. Global climate change is cyclical and happens naturally; however, modern human society’s impact has had unprecedented negative effects. Data show a correlation between the timing of temperature changes and drivers of climate change. Prior to the Industrial Era (pre-1780), there were three drivers of climate change that were not related to human activity: Milankovitch cycles, sun intensity, and volcanic eruptions. Greenhouse gases, probably the most significant drivers of the climate, include carbon dioxide, methane, water vapor, nitrous oxide, and ozone. Human activity, such as the burning of fossil fuels, releases carbon dioxide and methane, two of the most important greenhouse gases, into the atmosphere. Deforestation, cement manufacture, animal agriculture, the clearing of land, and the burning of forests are other human activities that release carbon dioxide. Since it is not possible to go back in time to directly observe and measure climate, scientists use indirect evidence to determine the drivers, or factors, that may be responsible for climate change. The indirect evidence includes data collected using ice cores, boreholes (narrow shafts bored into the ground), tree rings, glacier lengths, pollen remains, and ocean sediments. The data shows a correlation between the timing of temperature changes and drivers of climate change. Before the Industrial Era (pre-1780), there were three drivers of climate change that were not related to human activity or atmospheric gases: the Milankovitch cycles, solar intensity, and volcanic eruptions. The Milankovitch cycles describe how slight changes in the earth’s orbit affect the earth’s climate. The length of the Milankovitch cycles ranges between 19,000 and 100,000 years. In other words, one could expect to see some predictable changes in the earth’s climate associated with changes in the earth’s orbit at a minimum of every 19,000 years. The variation in the sun’s intensity is the second natural factor responsible for climate change. Solar intensity is the amount of solar power or energy the sun emits in a given length of time. There is a direct relationship between solar intensity and temperature: as solar intensity increases (or decreases), the earth’s temperature correspondingly increases (or decreases). Changes in solar intensity have been proposed as one of several possible explanations for the Little Ice Age. Finally, volcanic eruptions are a third natural driver of climate change. Volcanic eruptions can last a few days, but the solids and gases released during an eruption can influence the climate over a period of a few years, causing short-term climate changes. The gases and solids released by volcanic eruptions can include carbon dioxide, water vapor, sulfur dioxide, hydrogen sulfide, hydrogen, and carbon monoxide. Greenhouse gases are probably the most significant drivers of the climate. When heat energy from the sun strikes the earth, gases known as greenhouse gases trap the heat in the atmosphere, similar to how the glass panes of a greenhouse keep heat from escaping. The greenhouse gases that affect earth include carbon dioxide, methane, water vapor, nitrous oxide, and ozone. Approximately half of the radiation from the sun passes through these gases in the atmosphere, striking the earth. This radiation is converted into thermal radiation on the earth’s surface; a portion of that energy is re-radiated into the atmosphere. Greenhouse gases, however, reflect much of the thermal energy back to the earth’s surface. The more greenhouse gases there are in the atmosphere, the more thermal energy is reflected back to the earth’s surface. Greenhouse gases, as they absorb and emit radiation, are an important factor in the greenhouse effect, or the warming of earth due to carbon dioxide and other greenhouse gases in the atmosphere. 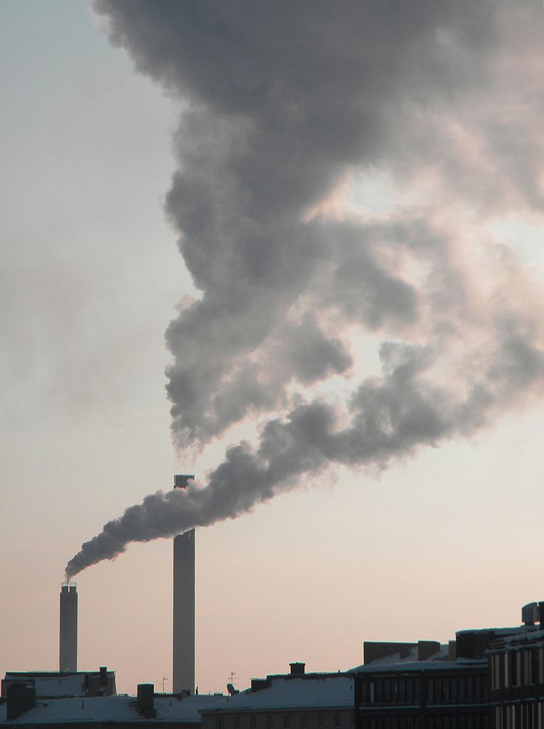 Greenhouse gasses: The burning of fossil fuels in industry and by vehicles releases carbon dioxide and other greenhouse gases into the atmosphere. 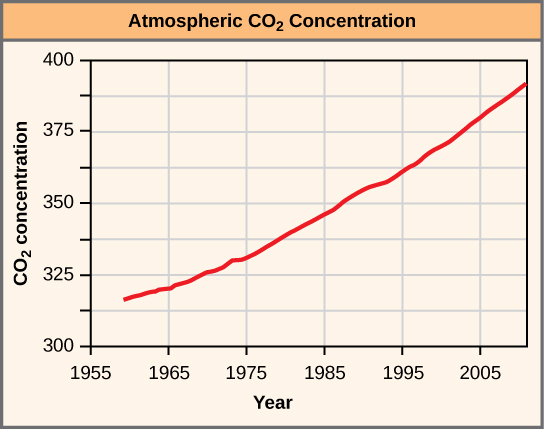 Beginning recently, atmospheric carbon dioxide concentrations have increased beyond the historical maximum of 300 ppm. The current increases in atmospheric carbon dioxide have happened very quickly: in a matter of hundreds of years rather than thousands of years. A key factor that must be recognized when comparing the historical data and the current data is the presence of modern human society. No other driver of climate change has yielded changes in atmospheric carbon dioxide levels at this rate or to this magnitude. Human activity releases carbon dioxide and methane, two of the most important greenhouse gases, into the atmosphere in several ways. The primary mechanism that releases carbon dioxide is the burning of fossil fuels, such as gasoline, coal, and natural gas. Deforestation, cement manufacture, animal agriculture, the clearing of land, and the burning of forests are other human activities that release carbon dioxide. Methane (CH4) is produced when bacteria break down organic matter under anaerobic conditions (i.e., without oxygen), which can happen when organic matter is trapped underwater, as in rice paddies, or in the intestines of herbivores. Methane can also be released from natural gas fields and the decomposition that occurs in landfills. Another source of methane is the melting of clathrates: frozen chunks of ice and methane found at the bottom of the ocean. When water warms, these chunks of ice melt, releasing methane. As the ocean’s water temperature increases, the rate at which clathrates melt is increasing, releasing even more methane. This leads to increased levels of methane in the atmosphere, which further accelerates the rate of global warming. This is an example of the positive feedback loop that is leading to the rapid rate of increase of global temperatures. Global climate change can be understood by analyzing past historical climate data, such as atmospheric CO2 concentrations in ice cores. Climate change can be understood by approaching three areas of study: (1) current and past global climate change, (2) causes of past and present-day global climate change, and (3) ancient and current results of climate change. Since we cannot go back in time to directly measure climatic variables, such as average temperature and precipitation, we must rely on historical evidence of earth’s past climate, such as Antarctic ice cores. Three significant temperature anomalies, or irregularities, have occurred in the last 2000 years: the Medieval Climate Anomaly (or the Medieval Warm Period), the Little Ice Age, and the Industrial Era. With the beginning of the Industrial Era, atmospheric carbon dioxide began to rise. Measuring historical climate change: By measuring the amount of CO2 trapped in ice, scientists can determine past atmospheric CO2 concentrations. Temperatures relative to the present are determined from the amount of deuterium (an isotope of hydrogen) present. Climate change can be understood by approaching three areas of study: (1) evidence of current and past global climate change, (2) causes of past and present-day global climate change, and (3) ancient and current results of climate change. Since scientists cannot go back in time to directly measure climatic variables, such as average temperature and precipitation, they must, instead, indirectly measure temperature. To do this, scientists rely on historical evidence of earth’s past climates. Antarctic ice cores are a key example of such evidence. These ice cores are samples of polar ice obtained by means of drills that reach thousands of meters into ice sheets or high mountain glaciers. Viewing the ice cores is like traveling backwards through time; the deeper the sample, the earlier the time period. Trapped within the ice are bubbles of air and other biological evidence that can reveal temperature and carbon dioxide data. Antarctic ice cores have been collected and analyzed to indirectly estimate the temperature of the earth over the past 400,000 years. Before the late 1800s, the earth had been as much as 9°C cooler and about 3°C warmer. 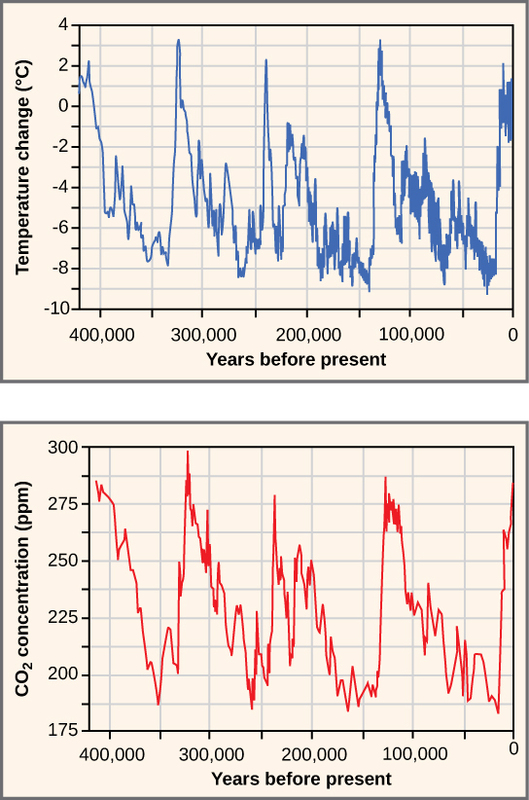 Atmospheric concentration of carbon dioxide also rose and fell in periodic cycles; note the relationship between carbon dioxide concentration and temperature. Carbon dioxide levels in the atmosphere have historically cycled between 180 and 300 parts per million (ppm) by volume. Climate change and the Industrial Era: The atmospheric concentration of CO2 has risen steadily since the beginning of industrialization.The Industrial Revolution, which began around 1750, was characterized by changes in much of human society. Advances in agriculture increased the food supply, which improved the standard of living for people in Europe and the United States. New technologies were invented, providing jobs and cheaper goods. These new technologies were powered using fossil fuels, especially coal. The Industrial Revolution in the early nineteenth century ushered in the beginning of the Industrial Era, a period when atmospheric carbon dioxide began to rise. When a fossil fuel is burned, carbon dioxide is released. Two significant temperature anomalies, or irregularities, have occurred in the last 2000 years. These are the Medieval Climate Anomaly (or the Medieval Warm Period) and the Little Ice Age. A third temperature anomaly aligns with the Industrial Era. The Medieval Climate Anomaly occurred between 900 and 1300 AD. During this time period, many climate scientists think that slightly-warmer conditions prevailed in many parts of the world; the higher-than-average temperature changes varied between 0.10 °C and 0.20 °C above the norm. Although 0.10 °C does not seem large enough to produce any noticeable change, it did free seas of ice. Because of this warming, the Vikings were able to colonize Greenland. The Little Ice Age was a cold period that occurred between 1550 AD and 1850 AD. During this time, a slight cooling of a little less than 1 °C was observed in North America, Europe, and possibly other areas of the world. This 1 °C change is a seemingly-small deviation in temperature (as was observed during the Medieval Climate Anomaly); however, it also resulted in noticeable changes. Historical accounts reveal a time of exceptionally-harsh winters with much snow and frost. Results of climate change, past and present, have been documented and include species extinction, rising sea levels, and effects on organisms. Global warming has been associated with at least one planet-wide extinction event during the geological past; scientists estimate that during the Permian period, approximately 70 percent of the terrestrial plant and animal species along with 84 percent of marine species became extinct. Glacier recession and melting ice caps are direct effects of current global climate change, ultimately leading to higher global sea levels; as glaciers and polar ice caps melt, there is a significant contribution of liquid water that was previously frozen. Changes in temperature and precipitation are causing plants to flower earlier, before their insect pollinators have emerged; mismatched timing of plants and pollinators could result in injurious ecosystem effects. This mismatched timing of plants and pollinators could result in injurious ecosystem effects because, for continued survival, insect-pollinated plants must flower when their pollinators are present. Scientists have geological evidence of the consequences of long-ago climate change. Modern-day phenomena, such as retreating glaciers and melting polar ice, cause a continual rise in sea level. Changes in climate can negatively affect organisms. Global warming has been associated with at least one planet-wide extinction event during the geological past. The Permian extinction event occurred about 251 million years ago toward the end of the roughly 50-million-year-long geological time span known as the Permian period. This geologic time period was one of the three warmest periods in earth’s geologic history. Scientists estimate that approximately 70 percent of the terrestrial plant and animal species and 84 percent of marine species became extinct, vanishing forever near the end of the Permian period. Organisms that had adapted to wet and warm climatic conditions, such as annual rainfall of 300–400 cm (118–157 in) and 20 °C–30 °C (68 °F–86 °F) in the tropical wet forest, may not have been able to survive the Permian climate change. A number of global events have occurred that may be attributed to recent climate change during our lifetimes. Glacier National Park in Montana, among others, is undergoing the retreat of many of its glaciers, a phenomenon known as glacier recession. In 1850, the area contained approximately 150 glaciers. By 2010, however, the park contained only about 24 glaciers greater than 25 acres in size. One of these glaciers is the Grinnell Glacier at Mount Gould. Between 1966 and 2005, the size of Grinnell Glacier shrank by 40 percent. Similarly, the mass of the ice sheets in Greenland and the Antarctic is decreasing: Greenland lost 150–250 km3 of ice per year between 2002 and 2006. In addition, the size and thickness of the Arctic sea ice is decreasing. Glacial recession: The effect of global warming can be seen in the continuing retreat of Grinnel Glacier. The loss of a glacier results in the loss of summer meltwaters, sharply reducing seasonal water supplies and severely affecting local ecosystems. This loss of ice is leading to rises in the global sea level. On average, the sea is rising at a rate of 1.8 mm per year. However, between 1993 and 2010, the rate of sea-level increase ranged between 2.9 and 3.4 mm per year. A variety of factors affect the volume of water in the ocean, including the temperature of the water (the density of water is related to its temperature) and the amount of water found in rivers, lakes, glaciers, polar ice caps, and sea ice. As glaciers and polar ice caps melt, there is a significant contribution of liquid water that was previously frozen. In addition to some abiotic conditions changing in response to climate change, many organisms are also being affected by the changes in temperature. Temperature and precipitation play key roles in determining the geographic distribution and phenology of plants and animals. Phenology is the study of the effects of climatic conditions on the timing of periodic lifecycle events, such as flowering in plants or migration in birds. Researchers have shown that 385 plant species in Great Britain are flowering 4.5 days sooner than was recorded during the previous 40 years. In addition, insect-pollinated species were more likely to flower earlier than wind-pollinated species. The impact of changes in flowering date would be mitigated if the insect pollinators emerged earlier. This mismatched timing of plants and pollinators could result in injurious ecosystem effects because, for continued survival, insect-pollinated plants must flower when their pollinators are present.